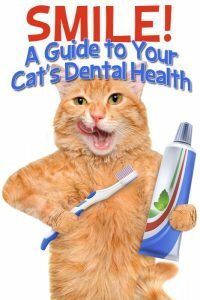 Easy and Simple Ways to Healthy Dental Tips in Your Cats! Practicing basic behaviors like sit, down, stay is very simple task for pet owner. But, knowing how to take care of your cat teeth seems a little trickier for most pet owners. That’s why most of the pet owners don’t give too much thought to their pet’s oral hygiene. Which is a shame; because pet’s dental health is just as important for pets as it is for human. It is fact. So if you notice that your cat has foul breath, it may a signal for teeth and gum issues. Actually, your feline friend is very good at hiding her pain. Hence, you might never know that your pet has a serious health problem until it turns into big one. This is a reason every pet owner requires a close attention to proactively address their needs. If you want to give more years with your precious pooch, then it is wise to start caring for your cat’s teeth from a young age of 3. However, cats that do not get proper dental care can suffer from terrible breath, gum disease or some harmful disease like gingivitis. One of the first things you have to do is build positive bonding and teach him that it is ok for people to have her teeth and lips touched. There is no need to take special time to do this. Whenever she is snuggled in your lap, gently lift her lip and rub a finger over his front teeth and gums. Repeat this daily until your cat used to this. This way you can get her ready to accept future dental prevention and care. As strong as your bonding is it will be easy and quick to establish teeth cleaning routine. Once your cat is used to be mouth touched by people, you can start to place a piece of gauze around your finger and dip it in the flavored liquid. Then slowly rub your finger on his gums and teeth in a circular motion. Do again and again until she feels comfy with this procedure. It is advised to keep positive attitude during every introducing sessions. Once she is used to the consistency of flavored gauze in her mouth, you can move ahead to choose the right toothbrush and toothpaste for your kitty. Always make use of cat toothpaste and a cat toothbrush. Never try any human toothpaste for your kitty. It can irritate her stomach. The cat toothpaste is readily available in various flavors, specifically in poultry, fish-flavor or malt flavor. To get her used to the flavor of the toothpaste, you have to first apply it on your finger and rub on cat’s gums. Next, you have to choose toothbrushes that designed particularly for cats. There are two choices either choose bristle (like humans use) or finger fit toothbrushes. Both work similarly, but finger fit toothbrush can be wise choice. Again, take things gently to get your cat used to the flavor of the toothpaste and toothbrush. It is fine to slowly introduce her for brushing. It takes time. So, when you first start, brush a few teeth with circle motions for some seconds and massaging the gums. 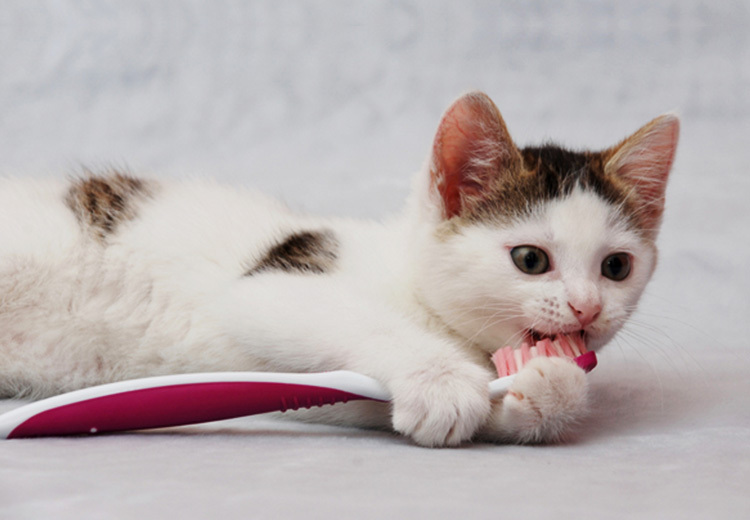 Regular brushing helps you to remove help remove plaque, control tartar buildup and freshen the cat’s breath. As initial stage, she may not ready to brush, but with time she will accustom brushing routine. Make the brushing time as much as enjoyable. Diet is another good habit in maintaining good health of your cat’s teeth. So, add some wet as well as dry foods or other cat food in her diet plan. Moreover, you can also offer her various meats. In some cases, when your pet has specific issues with tartar buildup and bad breath that cannot be treated by only brushing, vet may suggest a nutritionally balanced dental diet for your cat. Bones do a good job in removing tartar from the teeth. Plus scrub the teeth and massage the gums. Moreover, raw bones are also excellent for your cat’s health. Remember, the cat pork, chicken or fish bones can cause severe internal injuries. So never offer them. Playing with dental chews toys is also helpful habit for your cats to keep teeth healthy and tartar free. These chew toys are usually made of rubber, plastic or other synthetic material, especially to scrub and massage his teeth and gums by chewing and chomping. Pet love to chew and the right toy or chew treat can help satisfy their natural urge, as well as maintain good oral health many years to come.